The First Treaty of Saigon, signed on 5 June 1862 between the French and the last pre-colonial emperor of Annam, Tu Duc, ceded Saigon, the island of Poulo Condor and three southern provinces of what was to become known as Cochinchina to the French. This first treaty was confirmed by a second treaty, signed at Hue on 14 April 1863, which also stipulated the opening of three Vietnamese ports to trade, freedom for missionary activity and French authority over Vietnam's foreign affairs. Also by this agreement, Saigon was declared capital of French Indochine. As part for the negotiations for the Treaty of Hue, which confirmed the Treaty of Saigon of the previous year, an Annamite legation travelled to Paris in 1863. 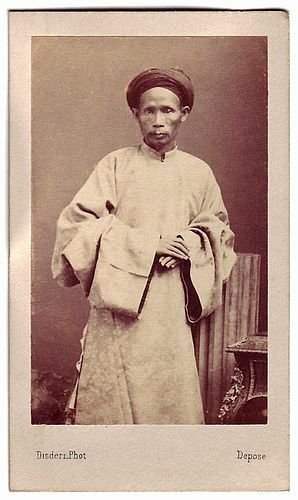 The senior mandarin committed suicide on his return to Indochine, when the French failed to honour the terms of the treaty.